Rottweiler Performance is a Southern California based design and manufacturing facility with the primary goal of creating useful products for consumers looking to customize their motorcycles beyond what the factory engineers have set for their target audience. Quite often what manufacturers create for the consumer can be very limited in scope and vision because of this. This includes the adventure market as well as dual sport, street and road racing. Our rich history in highly competitive motorsports uniquely positions us to draw from varying disciplines of engineering experience in order to reach our creative goals. About Chris Parker, owner and founder of Rottweiler Performance. My focus has always been to ask the question, "How can we take these incredibly well engineered machines and creatively manipulate them into what we, as a unique consumer with personalized needs would want from a motorcycle platform". We then take the answers we find and create new and bespoke products around those ideas. From the onset of Rottweiler Performance in 2011 our goals have always been geared towards finding that unique outlet to provide such parts and services that are either rare or non existent within the industry. My motorsports background stems back to 1993 when a custom fabricator named 'Filmore' (Phil Moore) took my under his wing and gave me a chance to prove myself with a welder. At the time I was self taught and had purchased my own fabrication equipment using my meager tax returns from working at the local grocery store for a minimum wage of $4.25 per hour. Some of that equipment is still in use today. A few years later and when the time came to move on, Phil remained one of my best friends and mentors and was solely responsible for introducing me to the beautiful lands of Baja Mexico. In this wonderous new place I would later crew chief and compete in SCORE class 10 and class 1 open wheel race teams, form my own 450 motorcycle team in which we finished a solid top ten in the world famous Baja 1000 three times and most importantly meet my beautiful wife Mariel, who today is in charge of the day to day inner workings and the glue that holds the shop together. I then took a job working for multi time rally champion Rod Millen, a world famous New Zealand rally driver and Mickey Thompson champion who created 'Rod Millen Motorsports', an ultra high end vehicle design and fabrication facility where I was an integral part of the build team responsible for the record holding Pike's Peak Unlimited race cars produced there. I will never forget how enamored I was over the engine in particular. A 2.1 liter 4 cylinder endurance motor built by Dan Gurney Inc. and Toyota Racing Development (TRD) that produced 1100 horsepower at sea level. It was then that I knew that I was hooked on internal combustion. You just can't listen to this car without getting goosebumps at the sound of the waste-gate. Heaven. When the time had come that I needed another change in my life I accepted an offer to run a prominent off road motorsports team based out of Southern California and primarily racing the SCORE desert series in Baja California, Mexico. I was to oversee the preparation and co-driving of the various cars including Class 10, a limited engine open wheel group and a Class 1, a similar class but unlimited engine. During my time we had won the prestigious Nevada 2000 (1999), Baja 2000 (1999), Baja 1000 (2002) Baja 500 (2003) and a class championship in 2005. Without question my years spent in Baja with these race teams taught me how to prepare a machine that would go the distance with minimal failure. Something I am very thankful for and have put into everything that we do at Rottweiler Performance. 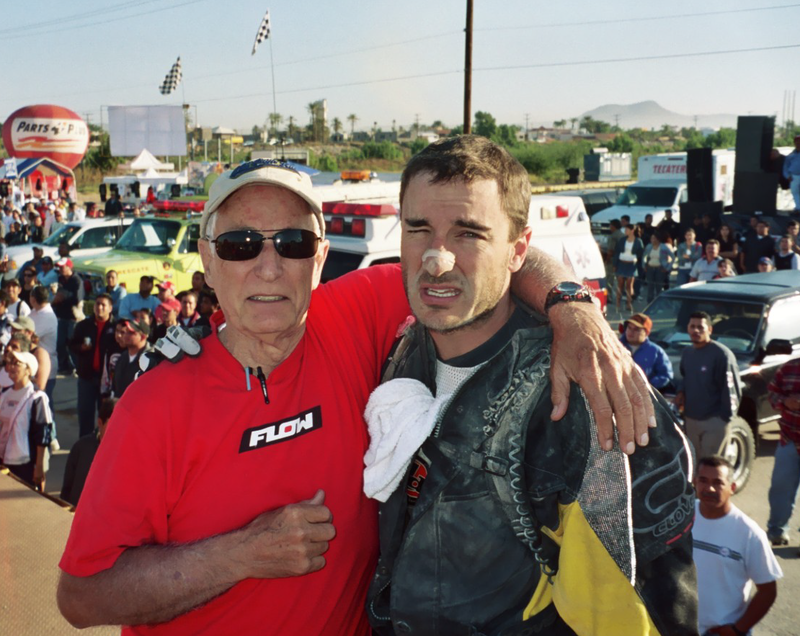 With my father 'Brownie' Parker at the 2006 Baja 1000 finish line in La Paz, Baja California. One of my most cherished moments. Lots more to come. I am tired of talking about myself right now. Let's talk about you and what you would like for your KTM or Husky!